Most train tickets can be purchased up to 30 days before the departure day when you book online or by telephone, and 28 days in advance when you buy them at train stations or local train ticket offices. However, tickets on trains like D overnight trains and Y trains (e.g. Lanzhou - Jiayuguan or Duanhuang) can be purchased 20 days before the departure day. Some other train tickets can be purchased only 4 days ahead. You are recommended to book tickets early, especially when your departure date coincides with a Chinese festival or holiday, such as the National Holiday (October 1st to 7th) and Chinese New Year (usually during the end of January and the beginning of February). See more dates when you should book train tickets early. 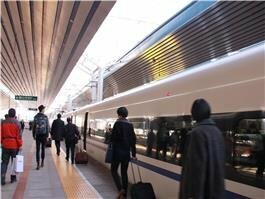 Many travelers would like to use China&apos;s vast and cheap rail network; however, obtaining train tickets is not an easy process (they are sold out quickly, there are long queues, and there are language problems, etc.). 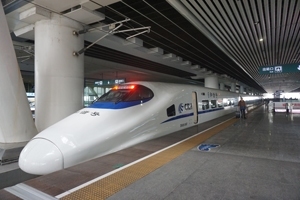 China Highlights makes train ticket online booking available to you to save you time, hassle, and money. All inquiries will be handled by China Highlights&apos; experienced and professional travel advisors to ensure you get the best service. Search for train prices and schedules and book a ticket now! China Highlights accept booking requests months ahead and will purchase your tickets as soon as reservations open. We do the extra to save your time. Collect by yourself at a train station: collect your tickets at any railway station with your passports or Mainland Travel Permits and a pick-up number which we will send to you via email. (Often there are queues at the pick-up counters, so make sure you calculate some extra time for picking up the tickets.) Seat selection service is available for high-speed trains when you choose to collect tickets by yourself at a train station. Ticket delivery service by China Highlights: use our hassle-free delivery service and select seats for free. Seat selection service is available for all trains. Tickets will be sent to your hotel or address in China before you arrive. 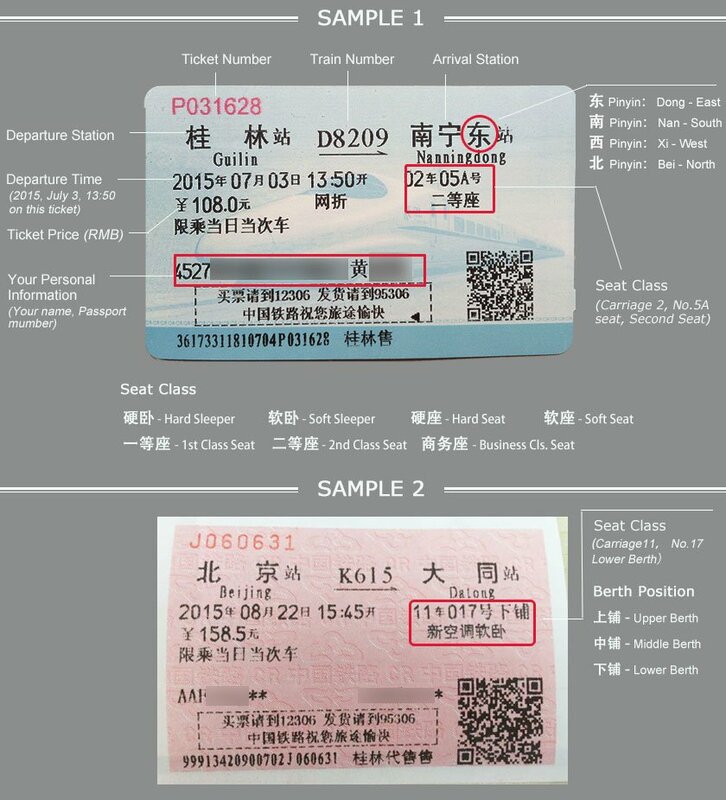 Also read How to collect Train Tickets after Booking Online with China Highlights. 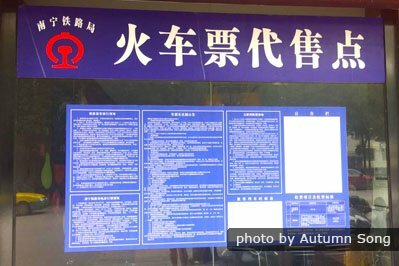 Buying tickets at train stations can be difficult for foreigners who cannot speak Chinese. Train stations sell tickets 28 days before departure. You need to queue in front of a ticket window to buy tickets. There are always long queues in front of each ticket window at train stations in large cities such as Beijing, Shanghai, Guangzhou, Hangzhou, Xi’an and Chengdu, especially during holidays. 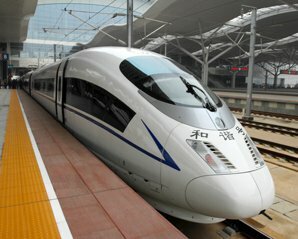 An electronic board over the windows will update the information regarding the availability of tickets in Chinese only. Bring all the passengers’ original passports. Expect long queues in front of the counters, especially during holidays. Your preferable train can be fully booked, especially for popular routes or during peak season (including Spring Festival, National Holiday, Mid-autumn Festival, Dragon Boat Festival, etc) . It is recommended to prepare alternatives. Staff at the train station cannot speak English. So it would be advisable to search train information in advance and write it down to show the person at the counter. Our travel advisors are glad to help with the translation or you can ask hotel staff to translate the information into Chinese. 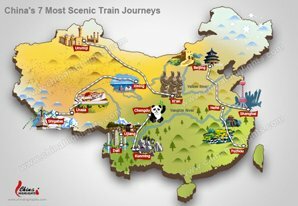 Check the ticket fare on China Highlights and prepare enough cash (RMB), as the train station does not accept foreign credit cards. Skip the Self-service ticket machines as they can accept Chinese ID only. Like train stations, ticket offices sell tickets 28 days in advance. But ticket offices are less crowded and located all over a city. RMB 5 will be charged per ticket as service fee. The working hours at ticket offices are usually from 9:00 am to 6:00 pm. Also bring your passports to buy the tickets. Only cash (RMB) is accepted. Tickets can not be collected here if you have made a booking online. Do not expect English to be spoken at a ticket office. It would be better to prepare a note in Chinese with the train number, travel date, and seat class. 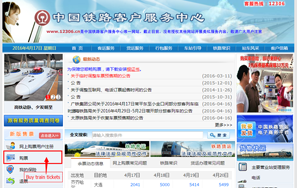 The China Rail official website sells tickets 30 days before departure. But it is also difficult for foreigners to use since the website is only in Chinese and only accepts Chinese bank cards. The official telephone number for ticket booking is area code + 95105105, e.g. Beijing: 010-95105105, Shanghai: 021-95105105, Guangzhou: 020-95105105, etc. Working hours are from 06:00 to 23:00. Only Chinese is spoken. Tickets can be booked by telephone 4 to 30 days in advance. 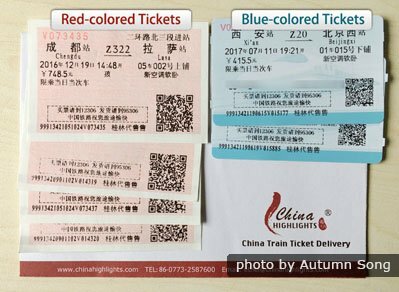 After a successful reservation, you need to collect the tickets at a train station within 24 hours and make a payment by cash (RMB), otherwise your booking will be cancelled. Please note: Passengers who hold red-colored tickets shall go through the manual ticket check and blue-colored ones to the automatic ticket check. Not interested in the above tours? Our tours can be customized or tailor-made from scratch. Just tell us your interests and requirements and we will help you design your China tour.